Nothing is more frustrating than struggling to take a grimy garbage bag out of your trash can with one hand, while your other hand fights to keep the lid open. Upgrade the look of your kitchen trash can and end the struggle at the same time with the Brim waste can by Umbra. Brim brings an element of style to an otherwise boring household essential thanks to its sleek lines and attractive satin finish that offers the look of brushed nickel without the inconvenience of having to maintain it. Best of all, you’ll love the convenience of the stainless-steel foot pedal that makes lifting the lid to toss a piece of trash virtually effortless. Plus, when it’s time to take out the trash, Brim’s contoured lid opens wide and locks into place for easy garbage bag removal. Designed by David Quan for Umbra, Brim is a large, modern looking garbage can that is designed to look as good as it performs. In addition to its sleek lines and attractive satin finish, Brim also features a built-in dampener that lowers the contoured lid gently and quietly along with an inner retention ring that holds the garbage bag securely in place while at the same time concealing the top of it so you get a neat, clean look with no garbage bag overhang. Made from ultra-durable polypropylene that you can rinse and wipe clean in a flash, Brim is built to last while at the same time being light-weight and easy to lift. Your Brim trash can measures 17 inches by 25.5 inches by 13 inches, with a large 13-gallon (50L) capacity and is designed to work with all brands of standard 13-gallon garbage bags, including draw-sting and flap-tie bags. All this means that Brim is perfect for use as your kitchen trash can, but equally suited to just about anywhere in and around your home (garage, workshop, basement, backyard, etc.) or even in a commercial environment (entryway, bathroom, etc.). 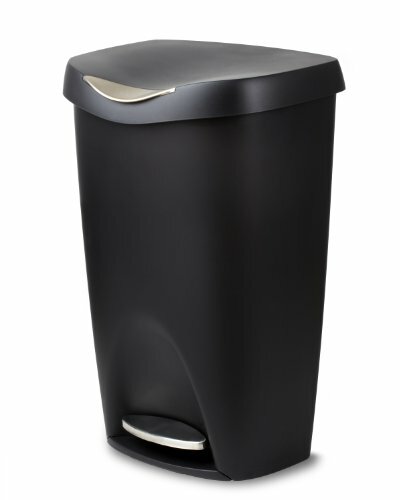 Upgrade your kitchen trash can today – order Brim and get the perfect blend of form and function!